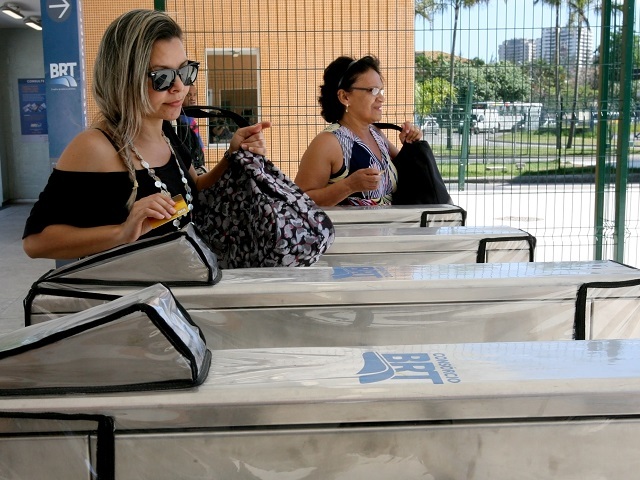 Passengers enter the TransOeste BRT in Rio de Janeiro, Brazil. TransOeste is one of many mass transport systems worldwide that has embraced fare integration, a critical component of multimodal integration. Photo by Benoit Colin/EMBARQ. This is the ninth post of the “Sustainable Urban Transport On The Move” blog series, exclusive to TheCityFix. Preparation of this series was possible thanks to a grant by Shell Corporation. Its contents are the sole responsibility of the authors. In addition to the need to invest in mass transport projects and expand urban mobility options, the recent UN-HABITAT Global Report on Human Settlements underscored the importance of multimodal integration – seamless connectivity between different transport modes – to maximize the impact of mass transport and enable sustainable urban mobility. Mass transport systems like bus rapid transit (BRT), light rail, and metro are infinitely more user-friendly when they connect to one another. Full-scale multimodal integration is characterized by two key features: integration of mass transport modes with each other, and integration of mass transport modes with other “feeder” modes such as taxis, shared-mobility services like car-sharing and bike-sharing, walking, and cycling – all of which help provide first- and last-mile connectivity. Infrastructure and operational integration – different transport modes connected physically as well as operationally. Information integration – information systems help service providers achieve operational integration in addition to providing real-time information to passengers on various modes regarding connectivity options, routes, schedules, and fares. Fare integration – integrated payment solutions like smart cards allow seamless access and payment across different modes. Additionally, a key enabling feature to achieving integration at these levels is the presence of a strong institutional framework, such as a unified metropolitan transportation authority, which can plan, coordinate, execute, and monitor the implementation of the above aspects. Key Building Blocks of Multimodal Integration. Graphic by EMBARQ. 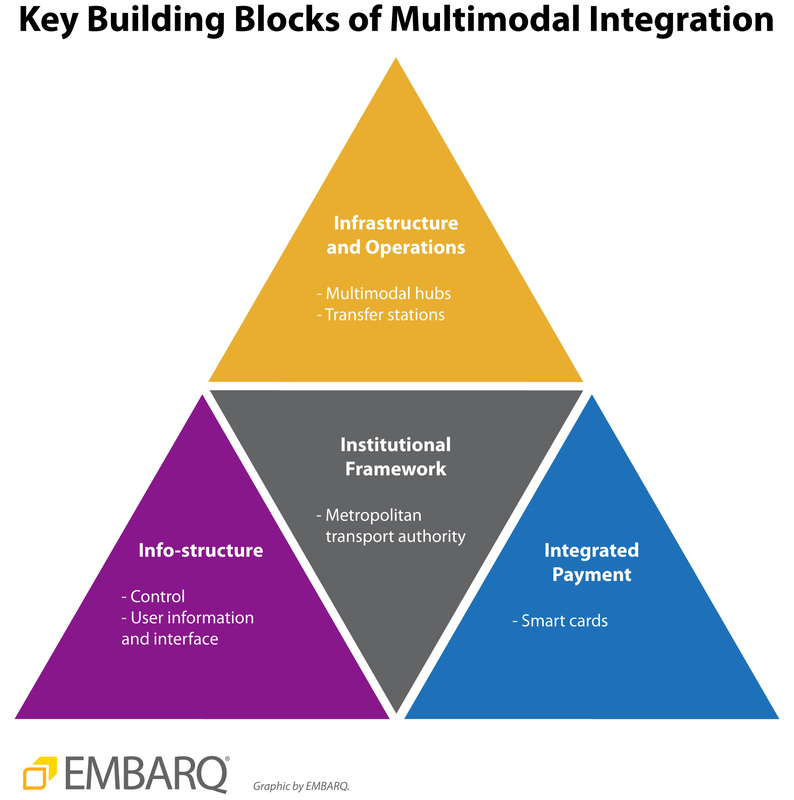 In the last few decades, integrated multimodal systems have evolved from systems with only infrastructure integration to systems incorporating the multiple aspects of integration, including service, information, and payment integration. The table below highlights some of the key cities in the developed world that have achieved integration across various modes of mass transport. 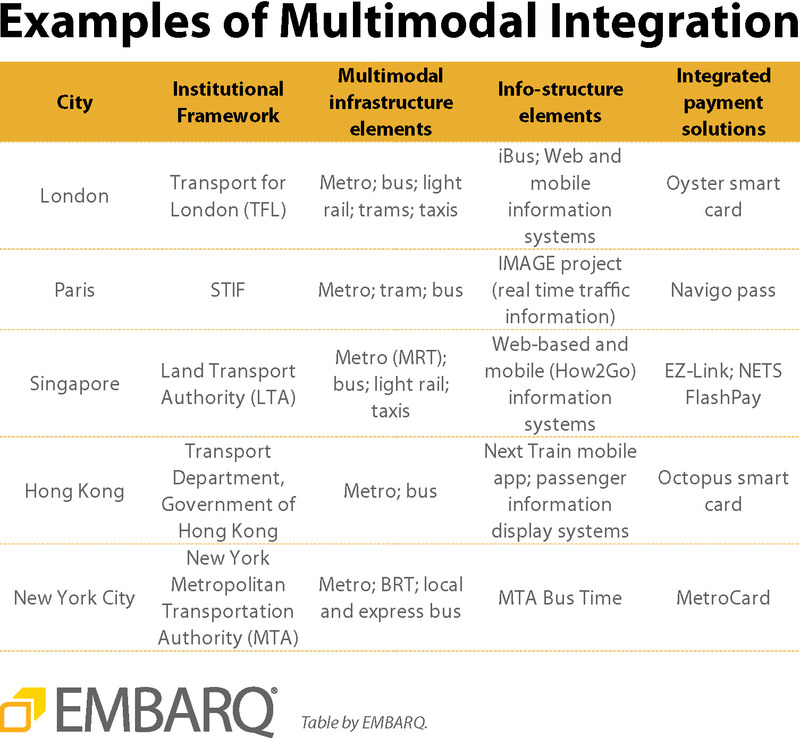 Examples of Multimodal Integration. Graphic by EMBARQ. A common thread among most of the above cities is the presence of strong institutional capacity. Two good examples are London’s Transport for London (TfL) and Singapore’s Land Transport Authority (LTA), which both serve as unified public transport authorities, helping ensure seamless integration across various modes, including metro, buses, light rail, and taxis. The next major step in multimodal integration for cities in the developed world is the integration of shared-mobility services, like car-sharing and bike-sharing, with mass transport. There are currently few cities that have made advances in this area, but some leading examples are showing the way for other cities to follow suit. Chicago’s Chicago Card Plus IGO Smart Card, for example, provides integrated access to public transport and car-sharing services. While most cities in emerging economies lag behind those mentioned above, some notable exceptions in Latin America and China are making significant strides in advancing mass transport integration. Santiago, Chile has undertaken ambitious efforts to reform its public transport system into an integrated network, while Mexico City, Mexico and São Paulo, Brazil are expanding smart card payment systems for use on multiple modes. The establishment of the Latin American Association for Integrated Transport Systems and Bus Rapid Transit (SIBRT) in 2010 has also been instrumental in facilitating peer-to-peer learning and advancing integrated multimodal mobility in Latin American cities. China, too, is on an ambitious path to deploy smart card systems for integrated public transport in cities across the country. By the end of 2011, over 57% of Chines cities – 380 total – had deployed public transport smart cards, with significant projected future growth. China is also a global leader in advancing the integration of bike-sharing with mass transport, as shown by the success of Hangzhou and Guangzhou. 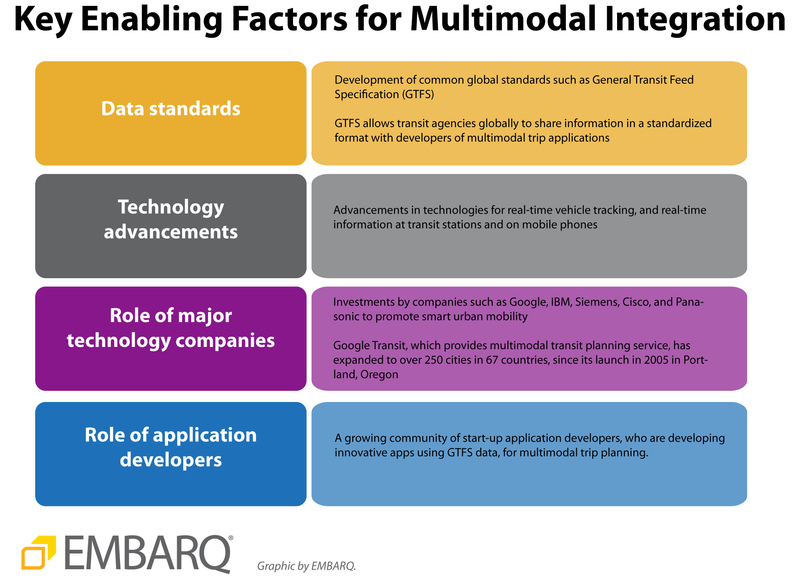 Key Enabling Factors for Multimodal Integration. Graphic by EMBARQ. Another major technological enabler is the evolution of integrated payment systems for multimodal trips through the use of contactless smart cards – a system currently deployed in more than 250 cities. Examples include London’s Oyster; Octopus in Hong Kong; EZ-Link in Singapore; Japan’s Suica; and OV Chipkaart in the Netherlands, which collectively serve millions of passengers every day. Furthermore, recent advances in Near Field Communications (NFC), a Wi-Fi enabled, contactless technology, are showing the potential to transform multimodal integration by enabling contactless payments through credit or debit cards, and mobile phones. Mobile payment applications for transport ticketing are currently being tested in the United States, Germany, Finland, and the Netherlands. Today, most cities in developed economies are fairly advanced in the deployment of integrated, multimodal transport systems due to a combination of factors, including key enabling policies like the presence of strong institutional frameworks and advanced information and technological systems. Looking to the future, the biggest opportunities for these cities lie in the integration of shared-mobility services with mass transport modes, and the advancement of new technologies, such as mobile payments for multimodal trips. In the developing world, achieving integrated multimodal mobility hinges on the ability of cities to develop strong unifying transport authorities, as well as the political will and vision to move toward integration. The proliferation of such systems is a significant advancement for people-oriented, sustainable transport systems that help urban residents move safely and efficiently through their cities. Heshuang Zeng, Dario Hidalgo, Kyle Mackie, and Ryan Schleeter also contributed to this blog.